Pushed by war and persecution, refugees experience physical and emotional stress. They suffer ambiguous loss, failed mourning, death of loved ones, or separation from parents. According to UNHCR, a record 68.5 million people have been displaced from their homes by war and conflict. The Institute for Economics and Peace estimates that violence cost the global economy $14.76 trillion in 2017, equal to 12.4 percent of the world’s gross domestic product or $1,988 per person. Unless we mitigate the impacts of forced displacement, they will continue to fuel global risks and undermine human resilience. To reverse these trends, we need to proactively invest in early responses to crises and in building resilience and peace. A durable solution to the plight of refugees is best achieved by addressing the root causes that push them away from their homes. While this requires global efforts, real action occurs at the local level. Cities—and organizations like Sister Cities International—can lead the way by integrating newcomers into their communities and by grooming citizen diplomats. When given opportunities and support, refugees are resilient people who can make positive contributions to world peace and the global economy. Simply defined, resilience is the ability to adapt to a difficult situation by bouncing back or moving forward. Despite their huge losses and assaults on their identity and dignity, refugees demonstrate the human capacity to survive. Through experience, I have identified four key resilience factors: cultural values, frame of reference, drive for education, and community support. First, cultural upbringing plays an important role in coping with stressors. I was raised in a cattle-keeping society where I learned the values of bravery, self-reliance, independence, courage, and mutual obligation that gave me the foundation to endure future hardship. Second, it is critical to have a frame of reference that guides your decision. When I was six years old, my father wisely advised me, “Be strong-willed…Do not let anything weaken your heart.” His words have been my frame of reference. In addition, I equip my mental toolbox with positive attitude, calm, faith, and prayer. These assets would always strengthen my resolve to move on, whether I was walking barefoot in the desert for a thousand miles, sleeping on a dirty floor in the refugee camps, studying for exams on an empty stomach, or just when having a bad day. The third resilience factor is drive for education. We know that an idle mind is the devil’s workshop, but education keeps the mind busy—and it pays dividends. In my village, cows were the main socio-economic currency and the means for livelihoods. Without any cows in the refugee camps, we embraced formal education as a substitute. My first English class was in 1988 under a tree in the refugee camp. Without any notebooks, I took my first exam by writing the alphabet in the sand. For me, education was—and still is—a wise investment. Fourth, community support provides a strong coping mechanism. After the war disrupted our childhoods by separating us from our parents, we formed our own family of brothers in the refugee camps. In Tucson where I lived for five years, we had strong support from the community. Our mutual obligation and social cohesion provided a strong support system necessary for survival. In a time of crisis, we need to turn to one another, not against each other. Refugees can be an effective voice in the forced migration dialogue because they understand the situation from the perspective of both victims and survivors. Recognizing their strengths can help us to view them as source of inspiration, bridge-builders, and citizen diplomats. When President Eisenhower launched Sister Cities International more than 62 years ago, he envisioned a world where citizens can connect through people-to-people exchanges. The theory of change is clear: By forming strong community partnerships, people of different cultures would appreciate their differences and build relationships that would reduce the chance of new conflicts, thereby fostering a more peaceful world where humanity can thrive. Engaging youth in a movement to create world peace is a noble cause. Young people can be peacebuilders if they are given the right opportunities and the right tools. Stories of resilience provide experiential knowledge for this growing demographic, for whom social media is the main source of information. Organizations like Sister Cities International should engage youth through education, employment, and cultural exchanges. In 2009, I managed a study abroad portfolio of the State Department’s Critical Language Scholarship Program, which sends U.S. students overseas to learn foreign languages. On a site visit to Harbin, China, I was walking with students in the mall when some Chinese people waved at me. I waved back and said in Chinese, “Nǐ hǎo.” They rushed toward me in excitement. I stopped and said, “xiè xiè,” and then we shook hands. A simple gesture led to a people-to-people exchange. This kind of mutual understanding is the bedrock of international relations. We live in the era of disruption, where crises continue to increase in severity and magnitude. But Rick Hanson rightly observed, “Resilience is like the keel of a sailboat. As the winds of life blow, resilience keeps you balanced and moving forward.” When life pushes you hard, whether as a diplomat or an individual, keep moving forward and do not give up. In the end, if we turn a crisis into an opportunity, we will reap the resilience dividends. 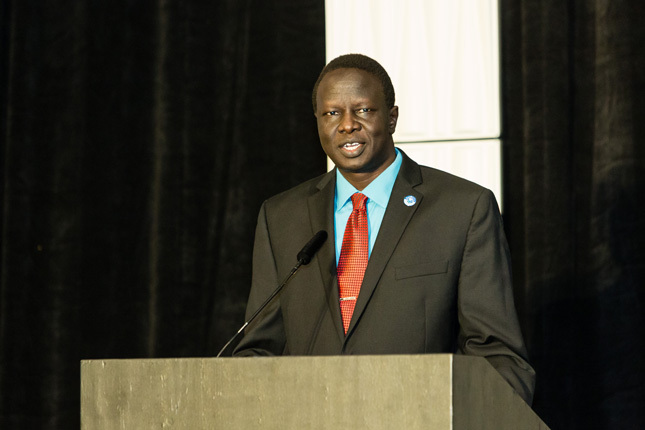 John Thon Majok, MPA, is a senior program analyst at the Wilson Center with the Global Sustainability and Resilience Program. This article is adapted from a keynote speech delivered at Sister Cities International’s annual conference on August 3, 2018, in Aurora, Colorado. Photo courtesy of Sister Cities International. All rights reserved.